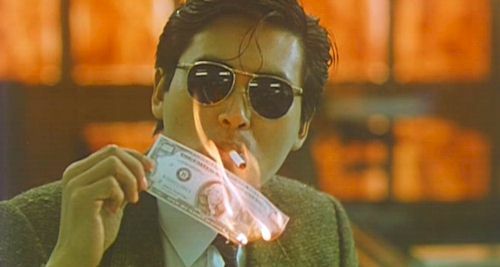 Chow Yun-Fat in quite possibly the quintessential Better Tomorrow image. The Skinny: If you don't know this movie, you don't know Hong Kong cinema. A Better Tomorrow is a little gangster film that became nothing less than a phenomenona multiple award winning, box-office smashing tour-de-force from John Woo that single-handedly changed Hong Kong cinema forever. In other words, it's pretty damn good. Every so often in film history, an accomplished director and a talented actor will become friends and team up for a variety of pictures, thrilling moviegoers in film after film. John Ford and John Wayne, Akira Kurosawa and Toshiro Mifune, and Martin Scorsese and Robert DeNiro are all good examples. A Better Tomorrow adds to that illustrious list, boasting yet another inspired duo: director John Woo and star Chow Yun-Fat. For John Woo, the film marked the revival of a then-sagging career. And while costar Ti Lung got a similar John Travolta-style career boost, it was Chow Yun-Fat who gained the most from the collaboration as he ascended from mere dramatic actor to a certifiable icon. The plot of this 1986 film centers on the lives of HK gangsters Ho (Ti Lung) and Mark (Chow Yun-Fat), two triads living the highlife due to their involvement in a counterfeiting scheme. Ho's younger sibling Kit (Leslie Cheung) adores his elder brother, but before long the two become separated by their professions. While Ho's a slick crook, Kit's quite the opposite: a police academy hopeful with something to prove. Despite his criminal ties, Ho vows to walk the straight and narrow for Kit's sake, but is instead double-crossed on that proverbial "last job" and sent to prison. Adding insult to injury, Ho and Kit are horrified to find that a hitman has murdered their father due to Ho's shady connections, thereby creating a significant rift between the formerly close brothers. And though super-cool gangster Mark avenges his imprisoned comrade in a fantastic guns-a-blazin' revenge sequence, the deed comes at a price: Mark's leg is crippled by an errant bullet. Time passes, but old wounds do not heal. With his chances for promotion shot straight to hell due to his brother's checkered past, Kit is a cop on a mission with a huge chip on his shoulder. In addition, poor Mark has fallen from grace in the organization becoming more or less a janitor due to his hobbling injury. On the other hand, Ho finds some luck in his life by getting a job driving a taxicab for a boss (Kenneth Tsang) friendly to ex-cons. But unfortunately, it would seem that Ho's relationship with Kit is irreparable. Even worse, former lackey Shing (Waise Lee) has become a crime boss in Ho's absence and has taken umbrage with Ho's adamant desire to stay honest. Angry at the snub, Shing goes after Ho's loved ones: Kit gets plugged (he survives) and Mark is beaten half to death. In the end, the trio form an uneasy alliance, fulfilling an earlier philosophical musing by world weary Mark. When questioned about the existence of God, Mark responds, "Yes, I'm one, you're one. A god is someone who controls his destiny." And with guns in the hand, they do.  The movie is actually a remake of the 1967 film called Story of a Discharged Prisoner, directed by Patrick Lung Kong and starring Patrick Tse Yin. Tsui Hark had been toying with the idea or a remake since his days in the TV business, but because of an overwhelming workload, had to pass the directorial reins to John Woo.  Tsui Hark instructed the screenwriters to portray the mobsters as counterfeiters rather than drug traffickers to up the "hero" factor.